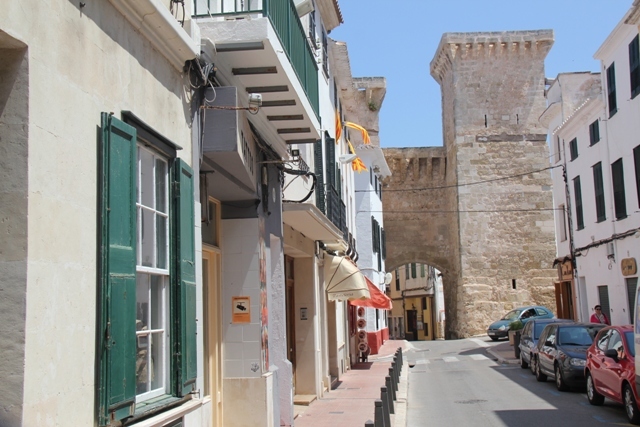 It seems a Monday night is not the best night to look for a restaurant in Menorca’s capital Mahon (or Mao as locals call it), as most of them are closed. Perhaps not the perfect way for me to prepare for a week of touring Menorca by bike then, as I was looking forward to stocking up on a few carbs before the start of my bike tour. Ironically, after walking around most of the town, relying on Google’s optimistic “this restaurant is currently open” message, only to discover it’s not, I stumble across Casa Sexta just a few metres from my hotel. Never mind, I say to myself through gritted teeth, I could do with the exercise. 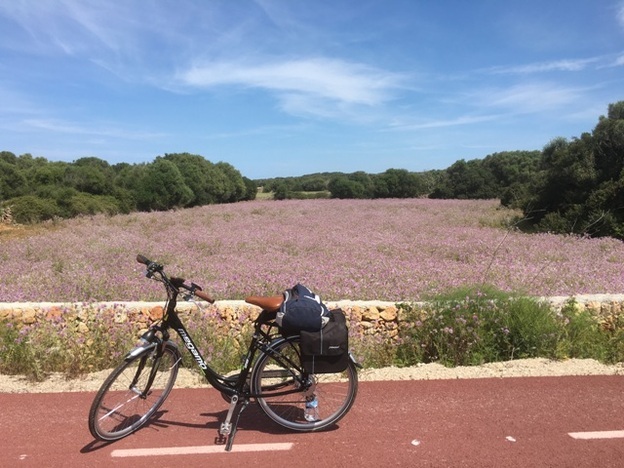 I’m taking six days touring Menorca by bike, riding, in the main, the island’s network of quiet country lanes, each one lined by its famous rows of traditional dry stone walls. Clearly, Xavier had decided I was a cycling natural. I’m taking an E-Bike for this trip; it’s a normal road bike but with the addition of a small electric motor that helps you to keep pedalling on uphill stretches. It doesn’t do the pedalling though, that is still down to you. Truth be told, a full charge will last all day with conservative use, and I was determined to only get help on the steeper hills. 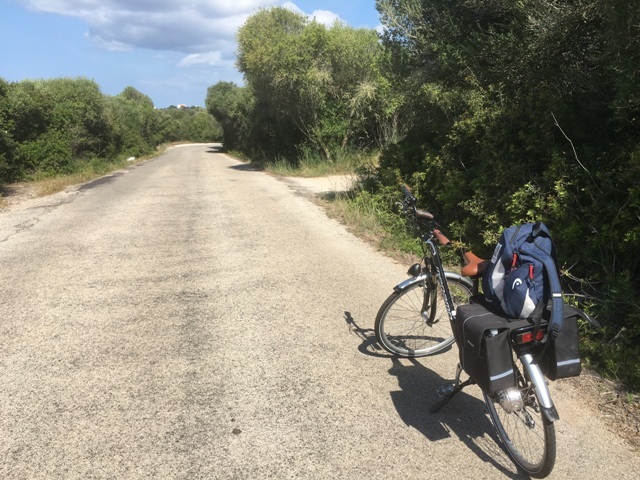 A quick lesson on recharging the battery each night (just plug in the lead) and the GPS (ditto) a reminder to loop the lock around the front wheel each time I leave the bike and I was all set for tomorrow’s first ride from Mahon to Alaior in the agricultural centre of Menorca. With a wave and a promise to transport my luggage to my new hotel each day before I arrived, Xavier was off, leaving me his phone number for any emergencies and me to find a restaurant that’s open. The morning is warm and sunny as I don my padded lycra shorts and helmet and climb on the bike. The GPS is fired up and there’s water in the bag. The most difficult part of the journey is pushing the bike up out of the underground garage, an almost vertical elevation that has me reaching for the water before I’ve even started. Just a few minutes later, having negotiated a bit of Mahon traffic, I’m on a country lane passing fields and orchards and hearing nothing but birdsong. The dry stone walls point the way as I cycle past more than few impressively whitewashed villas and through a few sleepy hamlets. At Sant Clement the first small town of any note, I pause for a drink and a stretch, my silent solitude marred by the occasional whine of a jet engine from the nearby airport. 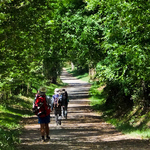 I’m heading for the Cales Caves some 20 kilometres in, but I stop off for a cold beer and a sandwich at Nelson’s, a pub I pass seemingly in the middle of nowhere and named after the famous admiral. Who knew? The Cales Caves are a fabulous find. 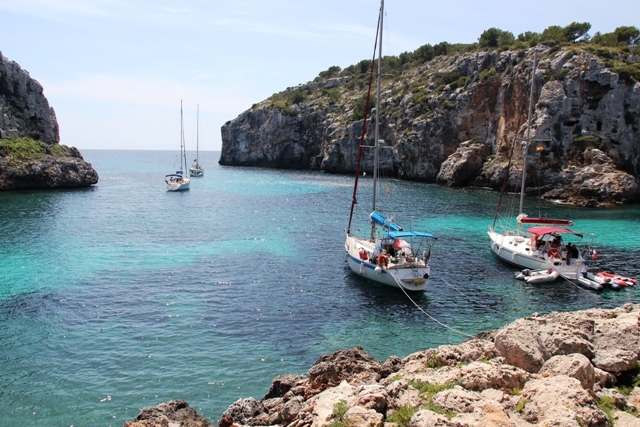 A tiny cove with stunning turquoise water surrounded by cliffs containing man-made prehistoric burial caves. I walk along a well trodden path around the cove until I arrive at a stunning spot at the mouth of the cove. Boats are anchored just off shore and people are swimming in the crystal clear water. This is really quite something. 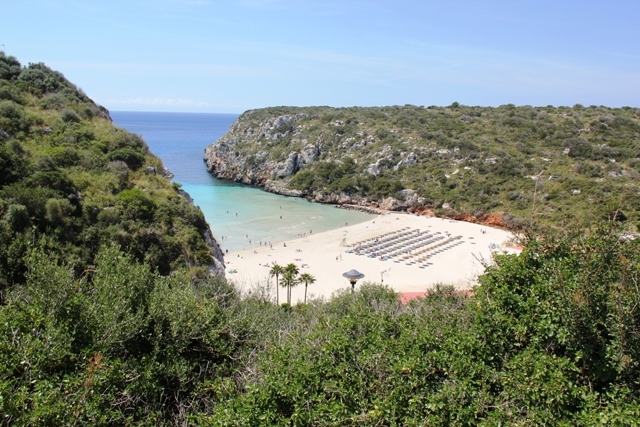 No more than a few kilometres further is Cala en Porter, a pretty little resort town although quite touristic. 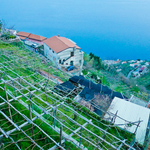 The town and its restaurants are high up on the cliff top but there is a beautiful beach nestling in the bay below, accessible via a wooden staircase. Time to move away from the coast and over to Alaior for my overnight stay. 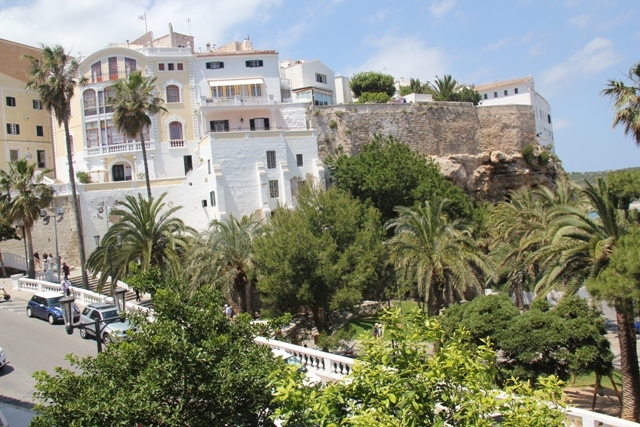 I arrive at Alaior late afternoon, a town famous for its master bakers and their traditional sweet pastries and La Menorquina ice cream. 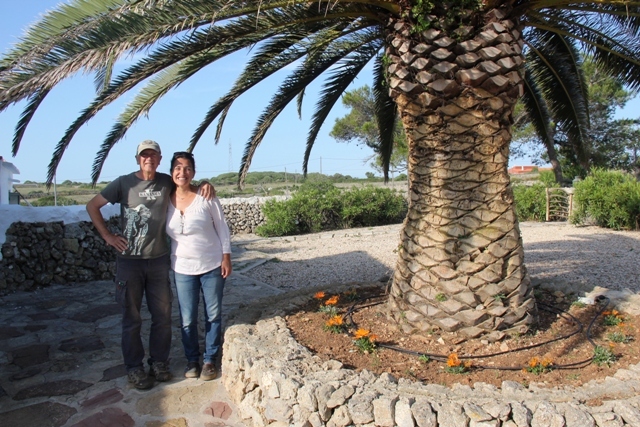 Finca Llimpet is beautiful property just outside town in the countryside, run by Jesus and Itziar who, having ditched their architect practice in Seville, have spent the last three years converting this old farmhouse into a wonderful boutique rural Agrotourisme Casa Rurales. I am here for two nights, as tomorrow’s route is a circular one around the north coast. 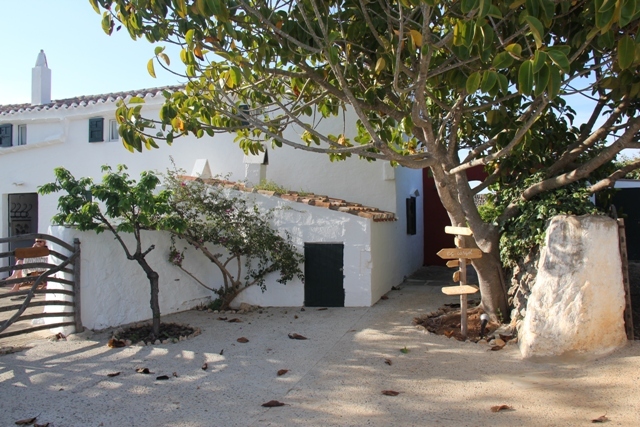 My luggage is waiting for me in my two-room cottage, and after I plug in my chargers and take a well deserved shower, Itziar greets me like a long lost son and insists I take a dip in the pool before she points out a few recommendations for dinner in town. Breakfast out on the sunny terrace watching Jesus feed his flock of sheep is an amusing diversion as I wolf down some local bread and cheese and fresh eggs from Limpet’s own hens. 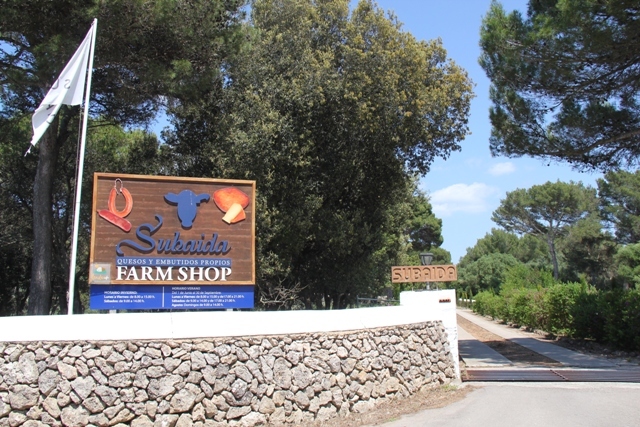 Talking of cheese, my first stop is the Subaida cheese factory just 2 kilometres from here. Mao Cheese is world class and only made on Menorca. A visit to see this delicious cheese being made is free, as are the bite sized tasters on offer. Of course, it’s all too tempting and I can’t resist buying some. There is no doubt this is cheese making country as I cycle past farms and fields of cows on my way to Menorca’s rugged north coast. 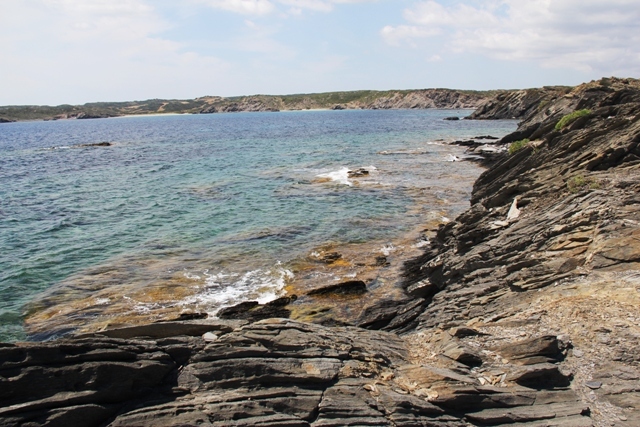 This is a coast open to the elements, the wind battering most of the rocky coastline into almost lunar like shapes. The solitary lighthouse at Cap Favaritx, at the end of a single winding road, stands like a sentinel on ancient black and grey slate carved into all kinds of weird and wonderful shapes and flanked by an esplanade of salt flat pools. Legend has it that when there is a full moon, walking alongside these pools will reward you with strength, energy and fertility.I could do with some of that energy right now let alone wait until nightfall, as I ride back the way I came for a few uphill kilometres before turning off back towards Alaior and Finca Llimpet’s welcoming embrace.